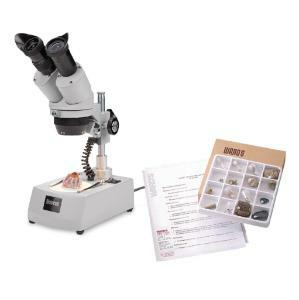 Our Boreal Science Microscopes feature all metal construction, a rugged "student-proof" design and precision optics making it a favorite among educators. This Boreal Science Stereomicroscope, model 5540400, features an inclined head for viewing comfort, full size 30cm optics and an easy adjust collar for precise control of focus tension. With rack and pinion focusing, rugged diecast metal construction and a reagent finish, this stereomicroscope is very durable. It has turret mounted 2x and 4x objectives for quick magnification changes and the dual illumination is ideal for specimen lighting. All Boreal microscopes are backed by our All-inclusive Warranty that covers parts, labor and shipping costs with no restriction on ownership. Don’t need 6? Buy 1 and get a Free Fossil Set! Take advantage of this exceptional offer. Buy 1 Boreal Science Stereomicroscope, model 5540400, and receive our Introductory Fossil Collection, model 500110 Free! This collection is a fine introduction to the classification of fossil animals and plants. Fossils from nine different phyla form a wide range of geological periods and are all carefully selected to illustrate important life forms and different modes of preservation.